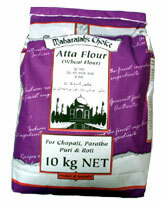 Place the Atta flour into a large bowl and gradually mix in enough water to make a pliable dough. Knead again and then cut into pieces about the size of a table tennis ball. This makes a small chapati. Increase the size if you prefer a larger sized chapati. Dip these balls in plain flour and roll out very thinly using a rolling pin. Heat a griddle or heavy bottomed frying pan until very hot. Cook the chapati for approx 15-20 seconds on one side. Turn when brown spots appear underneath and repeat the cooking process for the other side. Press lightly all over the chapati with an egg flip (or cloth) and the chapati should puff up. This is an indication that it is fully cooked. Spread freshly made chapatis with butter or ghee and serve immediately as an accompaniment to your Indian meal. To keep the chapatis hot and soft, wrap them in a clean cloth or baking foil. It is preferable to use lukewarm water as this makes a softer chapati.